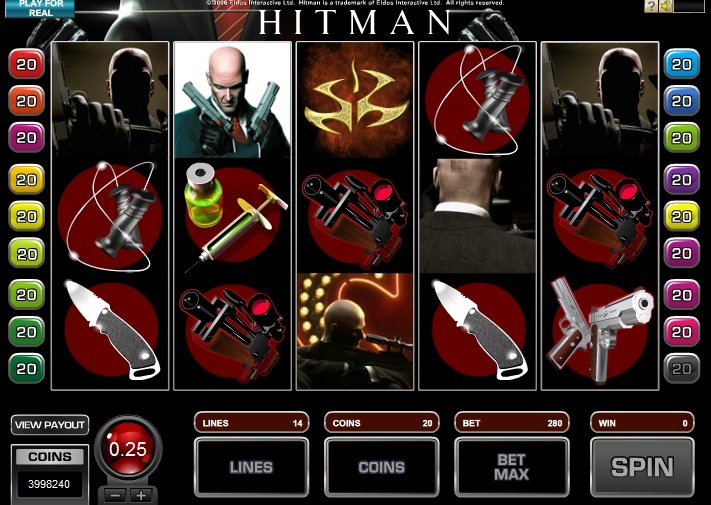 The release of Hitman slot on the Microgaming network back in 2008, was a big moment. Suddenly there was a range of great slots to play from this software provider, including Tombraider slot and the mighty Thunderstruck game. Unfortunately for US players, this was a similar time to when Microgaming completely stopped taking US citizens, which is still the same today. 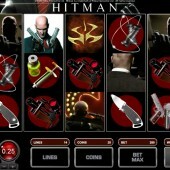 Having played Hitman for myself, I would say it is one of Microgaming's better slots. My biggest critism with this game is that it can take an age for the Contract bonus to trigger, but when it does arrive it can be very rewarding. You need to hit 3 green calculator's on reels 3, 4 and 5 to activate it. You then pick a target and are paid randomly. Each target has a scale of pay, with the wider ones offering potentially higher rewards for more risk. Your multiplier is randomly selected and can be up to 6x. There are two other bonuses in Hitman, including the Insignia Bonus (pick your win) and the Free Spins Bonus which rewards 18 free spins at 2x multipler. If you get the expanding wilds appearing in the free spins you can see some decent rewards and it can retrigger at any time. Just one word of caution with this game. Make sure you keep your bankroll in check on Hitman as it has been known to go for long periods without a win. Well it has for me anyway.